B 17G 42-31241 crashed on Ødegaard farm 29/4 1944. The aircraft belonged to USAAF, 8 Air Force, 303 Bomb Group, 427 Bomb Squadron. On its way to Berlin 42-31241 which was named “City of Wanette” was hit by flak at 11:14 hours while flying at 20.000 feet and started leaking fuel. It left the formation and jettisoned its bombs and feathered number 4 prop. 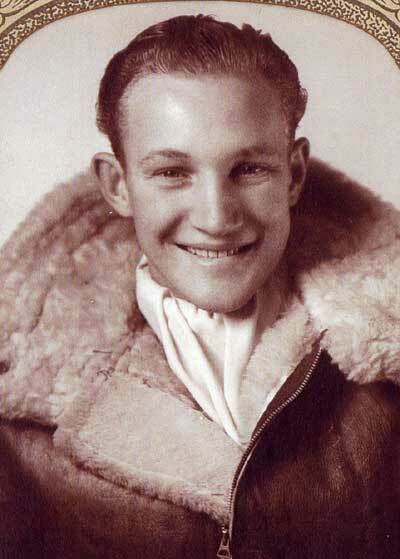 Pilot 2nd Lt Howard J. Bohle headed north towards Sweden. When over the islands of Lolland and Falster the B 17 was attacked by a Bf 110 of Stab III./NJG 3 piloted by Major Walter Barte while at the same time flak was fired. It was decided to bail out and Engineer S/Sgt Laurence W. Rice, Navigator 2nd Lt John K. Brown, Pilot 2nd Lt Howard J. Bohle, Bomb aimer 2nd Lt Joseph J. Nevills and Co-pilot 2nd Lt Robert R. Kerr bailed out of the nose hatch while it is not known haw the other crew members got out. It is however known that also Radio operator S/Sgt Henry A. Jensen, Ball turret gunner Sgt John A. Derschan, Right waist gunner Sgt Paul J. Muihearn, Left waist gunner Sgt Frank Gorgon and Tail gunner S/Sgt Michael Musashe all got out and floated down over Vålse Vig inlet through the flak barrage. At approx. 13:25 the B 17 crashed into the “Ødegaard” farm 5 kilometres northeast of Sakskøbing on the island of Lolland. It crashed into the 15 metres wide garden between the Guldborgroad and the farmhouse. The farmhouse burned down but luckily no one was hurt. Bohle, Brown, Nevills and Rice and Kerr all landed in the Vålse area. Two of the flyers landed in the Vålse Vig bay but were soon recovered while Bohle and two more flyers landed in the fields belonging to the farmers Johs. Rasmussen, Laurits Olsen and Wilhelm Petersen. Bohle, Brown, Nevills and Rice were soon captured by the Wehrmacht. It is not known to which POW camps they were sent. Kerr managed to escape and it is believed that he got on a fright train and travelled to Roskilde where he got in touch with people from the resistance. On 10/5 1944 he sailed from Sundby harbour onboard the fishingboat L 107 and in the Øresund sound he was transferred to the fishing vessel LA 127 “Ellen” which took him and others to Sweden. This was handled by “Danish-Swedish refuge service” which had specialised in helping people to Sweden. On the morning of 2/5 the dead body of S/Sgt Henry Jensen was found in Grønsund Sound between the islands of Bogø and Møn. The body was taken to Stubbekøbing where it was handed over to the Wehrmacht. On 8/5 1944 Jensen was laid to rest in Svinø cemetery. On 18/5 the body of Sgt Paul Muihearn was found in the Storstrømmen east of the Storstrømmen bridge still with his parachute attached. The body was taken to the chapel of Gyldenbjerg church at Orehoved. The Wehrmacht from Vordingborg collected the body and laid it to rest in Svinø cemetery on 22/5 1944. On the morning of 7/6 the body of Sgt John Derschan was found washed ashore in the Vålse Vig bay. The body was taken by boat to Orehoved harbour and on the the chapel at Gyldenbjerg church. It was picked up by the Wehrmacht from Vordingborg and was laid to rest in Svinø cemetery on 9/6 1944. At 07:00 on 8/6 the body of Sgt Frank Gorgon was found on Enø beach near Karrebæksminde. It was found 400 metres south of the farm “Overdrevsgaard” and was handed over to the Wehrmacht. He was laid to rest in Svinø cemetery on 9/6 1944. The remains of Muihearn, Derschan, Jensen and Gorgon were disinterred on 8/5 1948 and were evacuated to the American cemetery at Neuville en Condron in Belgium by the US military where Gorgon still rests. His comrades have been brought back to USA. S/Sgt Michael Musashe has no known grave and his name is found on Tablets of the Missing at Cambridge American Cemetery, Cambridge, England. Sources: MACR, Walter Barte, LBUK, “Danish-Swedish refuge service”, AS 19-280+281+288, DFEV.